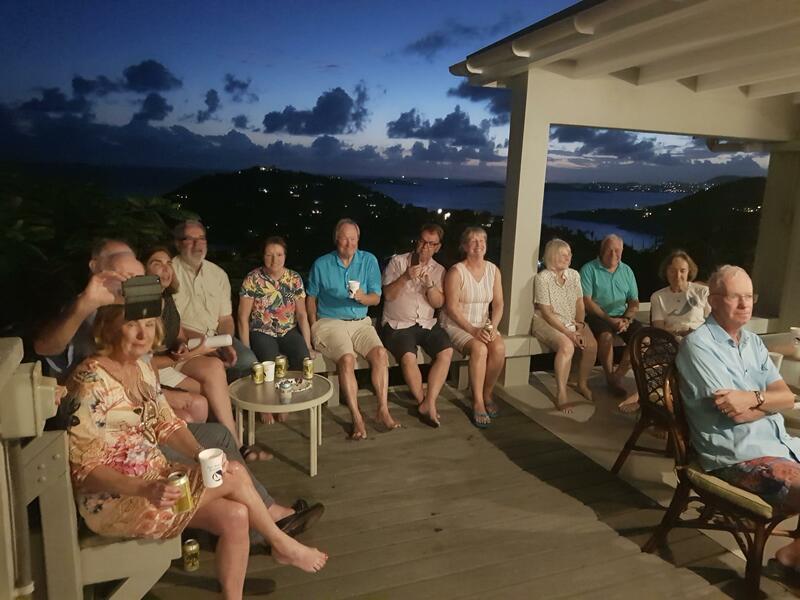 We had a great time in St John with our friends from the Blue Water Rally. Teri and Lee organized a great program, including a sail with snorkeling and a tour of the island, which has many wonderful beaches. Now we are on our way back to Vancouver and are stopping in Atlanta for two nights. We are staying in an old house that serves as a B&B, and visited a few sites today. Teri and Lee are hosting the Blue Water Rally Reunion this year and invited all 29 of us to their beautiful home tonight. It is great to spend time with our friends again and catch up with everyone. We flew from Miami to St Thomas yesterday, in the US Virgin Islands. The island group was named by Columbus on his second voyage and they have a checkered history. From 1671 on the Danish ruled this area, but sold it to the Americans in 1917. We took the ferry to St John, which boasts one of the safest and oldest harbors in the Caribbean. The island was settled by Taino Indians a couple of thousand years ago and I visited one of their sacred sites today, a waterfall with a pool and some petroglyphs. It was a wonderful hike, about 4km from the road, down to a nice beach. Coming back in the heat (28 deg C) was rather more strenuous. I met a deer and a few tourists on the way. We are staying above Cruz Bay in a lovely place. Tomorrow the Blue Water Rally Reunion begins here and we look forward to meeting our friends again from the time we sailed from Gibraltar to the South Pacific (2007-2009). We spent a night in Miami Beach, walked around a bit and went for a nice and large Italian dinner. The weather was quite windy and surprisingly cool, or maybe it just felt like this after the heat in Manuel Antonio. Like many other tourists, we spent a few days in Manuel Antonio on the Pacific Coast. This is very hot, great beaches and the smallest park in Costa Rica, Manuel Antonio. On the way there we passed huge palm oil plantations, and then enjoyed a few quiet days on the beach. During the visit to the rather crowded park we saw squirrel monkeys, but they were too fast for me to get a picture. The white faced Capuchin monkeys check up on people (and their packs) , and are much easier to photograph. On a kayak trip, we saw a horde of them taking a bath in the mangroves. Today we came back to San Jose to fly to Miami tomorrow. We have spent the last couple of days in Monteverde, exploring the cloud forest here. The roads in are all dirt roads with huge potholes, but there are quite a few tourists around. We are staying in a tree top house, and have done a number of wonderful excursions. 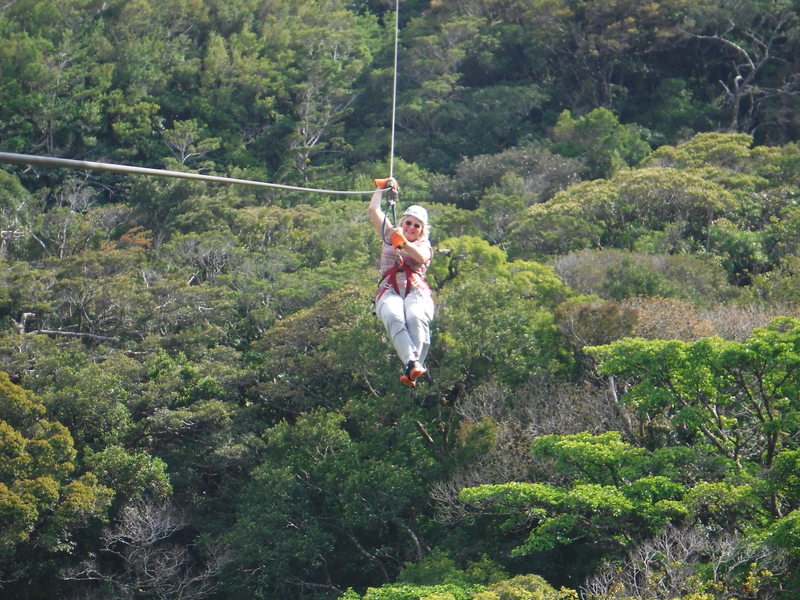 Pictures of our trip to the cloud forest, a zip line run (14 cables!) and a night excursion can be found by clicking on the links.